The lesson author assumes both Jesus and Paul studied the Old Testament scriptures to find a bases for coming to the conclusion that Jesus must first become a suffering Messiah. While it is uncertain what Adam or Eve or any other sinner in the history of fallen mankind may have understood by this statement of God, it is absolutely certain Jesus Christ knew and understood because as the Son of God he is one with God the Father. When conceived of the Holy Spirit and born here on earth of the Virgin Mary, it is very doubtful that he needed to study scriptures in the way the Apostle Paul did in order to understand what his role here on earth was to be or what he must suffer to fulfill that role or even that he needed to learn what he knew as our Creator. Jesus knew of the redemption plan before mankind had a need for redemption. Luke 2:39-52 is the only place in the gospels where we have a record of Jesus’ youth. At age twelve we see where he sat and talked with the teachers in the temple. From this we learn that 'all who heard him were amazed at his understanding and his answers’. This passage also mentions that 'Jesus increased in wisdom and in stature and in favor with God and man’. When his parents located him in the temple and ask why he was there he replied with “Did you not know that I must be in my Father’s house?” There is nothing in this passage to indicate how he grew in this wisdom or that he studied scripture as Paul would have to learn from them concerning his ordained role as mankind’s suffering Messiah. We only know that at age twelve he was fully aware that he was the Son of God and that the temple was his Father’s house. The series of examples used in the Quarterly lesson such as reference to Moses who was eighty years old and had spent forty years shepherding sheep before God considered him ready to lead Israel out of slavery is without merit because the need for a fallen sinner to mature and grow in sanctification according to God’s own timetable has virtually nothing in common with why a holy perfect and all-knowing Messiah would need to study the scripture to determine that he himself must suffer and pay sinful mankind’s penalty before he would rein in glory. God does not always explain the reason for his actions in a way we think he should answer. Since Jesus was holy, perfect and without sin, there was no need for Jesus to grow in sanctification before he could serve the purposes of the Father. When Jesus, in his youth, grew in wisdom it was not the same as a human born with a sin nature growing into maturity and then hopefully seeing his need for a Savior who would redeem him from the penalty of his sins. Because of his love God provided the only way for the penalty for sin to be paid which was the death of a perfect holy Savior who just happened to be his only Son, Jesus Christ. 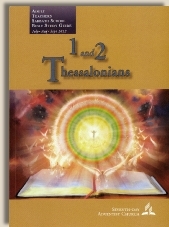 The Quarterly lesson assumes that both Paul and Jesus studied scriptures to understand the gospel message and why God does what he does. This is rather silly since Jesus knew full well what the plan for fallen mankind’s sin was before sin even existed in the world and that he would perform the central role in that salvation. Since Jesus is the Son of God he is and always was perfect and holy with no need to grow in sanctification. Only sinners need sanctification. Therefore, when Jesus grew in wisdom it was without precedence within the fallen human race. Giving examples of men who grew in sanctification before God was ready to use them in a glorious role explains nothing about why Jesus suffered on the cross, died, descended into the grave and then three days later was raised from the dead to be seating in glory at the right hand of the Father nearly two thousand years ago. Therefore, the only valid explanation of why Jesus was willing to suffer death as a payment for our sin is the Father’s love for the fallen human race.